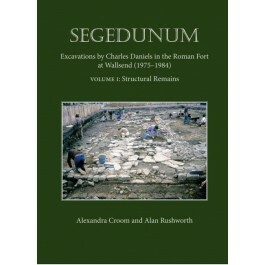 Between 1975 and 1984 almost the entire area of the Roman fort of Segedunum in Wallsend was excavated under the direction of Charles Daniels, senior lecturer in the Department of Archaeology at Newcastle University. It is these excavations which form the subject of this publication. This comprehensive report on the structural remains (Vol. 1) and finds (Vol. 2) show clearly that Daniels’ work represented one of the most ambitious and prolonged programmes of fieldwork attempted on the northern frontier up to that point and has made Wallsend one of the most fully investigated of Roman forts in Britain. In most areas the remains were not excavated down to natural and so the remains revealed were predominantly those of the 2nd and 3rd centuries, with some late Roman features. Volume 1 describes first the stratigraphic sequences and excavation of the stone and timber buildings of the fort’s central range: the granary, hospital, headquarters (principia), commanding officer’s house (praetorium), the forehall fronting the principia and granary, and a long narrow building, perhaps a workshop, on the north side of the eastern via principalis. In the case of all but the praetorium these buildings were fully exposed. Later chapters cover the buildings in the northern third of the fort, revealed to be a group of six infantry barracks which underwent several phases of rebuilding and refurbishment including partial replacment by a stable block. Parts 4 and 5 examine the cavalry barracks in the southern part of the fort (retentura) and excavations of sections of the fort defences on all four sides, particularly of discrete structures such as towers and gates. Volume 2, on the predominantly 2nd–3rd century material culture from the site, looks at the stonework, pottery, coins and small finds recovered. The stonework and ceramic building material provides information on the appearance of the fort and include a very rare stone latrine seat and a bench support. The pottery comprises samian, mortaria, including a large collection stamped by Anaus, amphorae and coarse wares. Other clases of artefact occur in comparatively small numbers, including colourless glass tablewares of the second and third centuries, 295 coins and c. 1000 small finds including some post-Roman pieces. Finally there is a detialed assessment of animal bone assemblages from a cistern and the Commanding Officer’s house.